Stride Inc., is a nationally recognized business for integrated employment of adults with Special Needs. We do this by selling office products. Our brands; Schneider Pens, QuickFit Binders, EasyFit, Primo, Aurora Casemade Products and Stride Write. Our products are strategically placed at office product retailers and online throughout the USA. Ask for Stride wherever you buy office products. Your support of Stride helps us maintain a mission to employ adults with Special Needs. Located in Albuquerque, NM, since 1981, the name Stride was trademarked in 1982 and was chosen because integrated employment allows Special Needs adults to make strides in their development and contribute meaningfully to our community. Stride Inc., is certified as a WBE (Women Owned Business Enterprise,) WOSB (Women Owned Small Business, DBE (Disadvantaged Business Enterprise,) and HUB (Historically Underutilized Business.) We view ourselves as partners with our customers, our employees, our community, and our environment. Our mission is to offer our customers exceptional customer service and terrific products while maintaining the corporate privilege of employing a unique and diverse workforce; adults with intellectual and developmental delays. At Stride, we are Changing Lives! Thank you for visiting our website! Stride is a family owned business currently in its 2nd generation. The remarkable story is that Stride was inspired by my son, Joey, who was born with hydrocephalus; a sever disability that prevented him from walking, talking, and caused him to be blind. Joey died at age 7, but his legacy is Stride, guiding our family to work with and for Special Needs Adults. As an employer of individuals with special needs, we motivate and encourage our employees to maximize their own personal and professional abilities. We are nationally recognized for our brand names, selling quality office products which are packed, assembled, labeled, and/or shipped by the best workforce available. 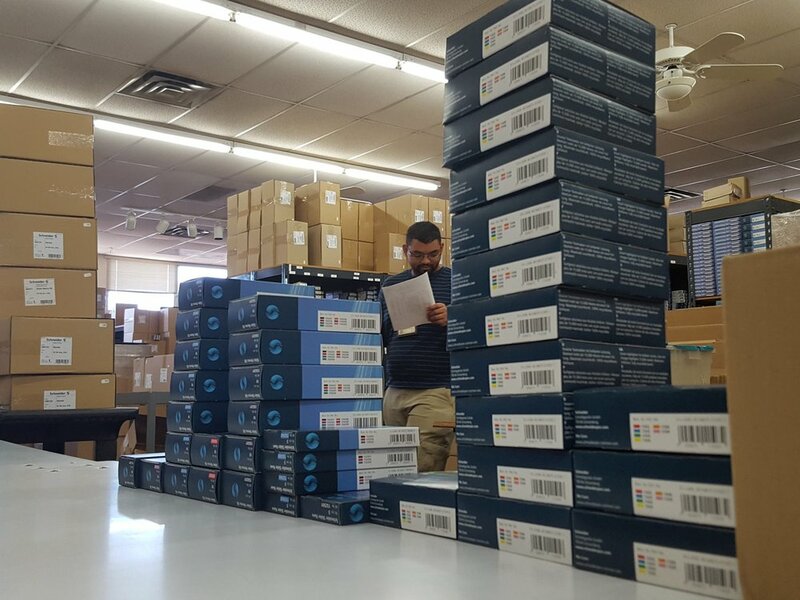 Each day, Stride ships to resellers throughout the country. The head of our Shipping and Receiving Department is Victor, who came to us as a Special Needs adult and is now a salaried employee. He is assisted by James and Peter, both on the Autism Spectrum. At Stride we are a family. All we do, every supply contract we have, and each deal we make is managed or accomplished with our Special Needs colleagues in mind. Stride Inc. is a happy workplace, and we love our special needs colleagues!